i need to be making! Love it all. I have a thing about red this season. 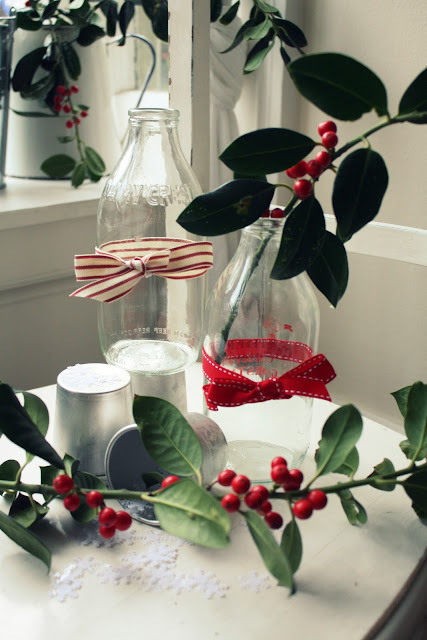 The combo of berries and string in the bottles are so simply perfect. Haven't seen the snow flakes before either. They are terrific. 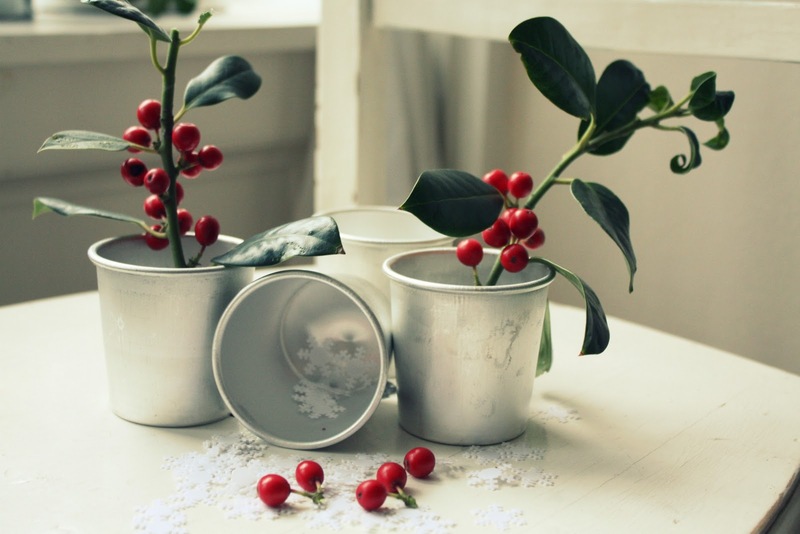 love how your simple bits and bobs look so festive when viewed through your special pics, melissa. love the red berries especially. i'll be thinking of you in the coming days as make your transition from one bit of paradise to another. so happy you'll be able to celebrate christmas in your beach house. What a lovely post.. and the pictures as adorable too. 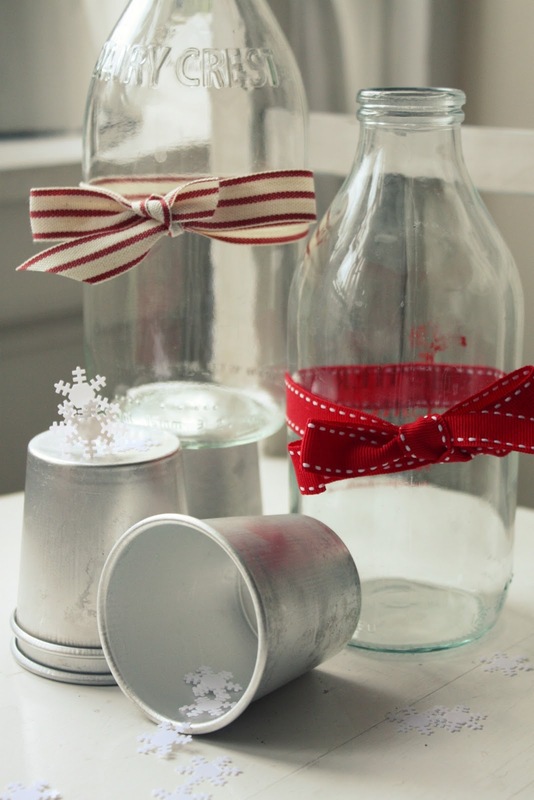 Cute ideas. I love the branches and berries. Pops of red always excite me. I think your decorating is simple and stylish and I really love it. I hope you enjoy heading home for Christmas. Yes it may be chaotic and different, but imagine the joy in reuniting with family and friends, the sunshine and laughter and the sense of belonging, of "home." I hope it is very special! Ps Wish we had holly like that for my house. I have just been posting about the same thing. 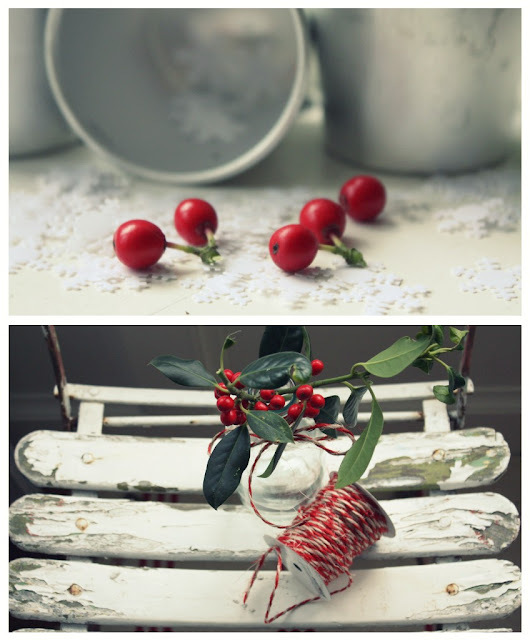 Using what you have around you, simple, unfussy, pops of red, ribbon....just gorgeous! LOVE this. I am all about the simple decorations also. I want just a pop of red or green against a simple palate, but just as you said, my ballerinas want the color and the flash. The two houses directly across the street are CRAZY decked out in neon lights and it's so jarring, I can't stand to look out my windows; yet the ballerinas think it's fabulous! i love that you are moving across the world in just a few short weeks and yet you are still decorating your current home for your family! i love you for that, seriously, it would be so easy to just pack it all up and forget it for this year. i love your decorations AND that fantastic husband of yours. happy weekend to you! This all has a very coastal farming feel Melissa. 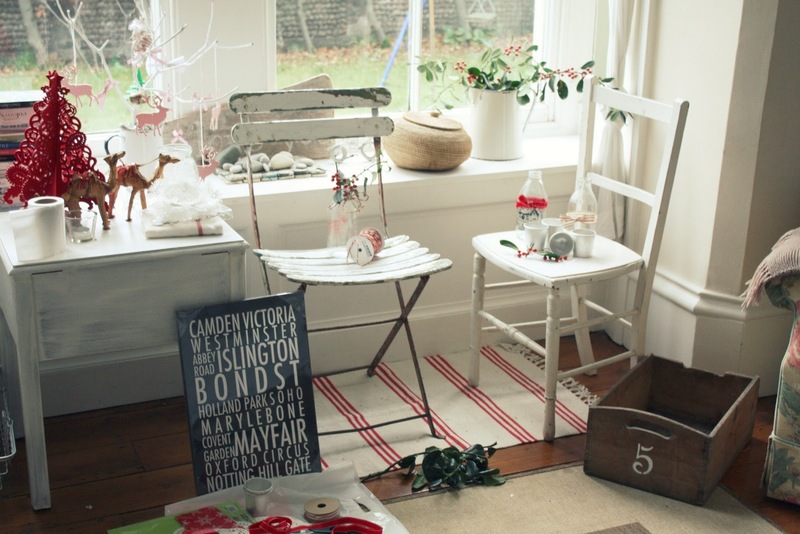 The red striped ribbon reminds me of striped beach towels on the sand, yet it's all so vintage country gorgeousness. Perfection yet again! I have just cleared away my creative corner (or mess!!) 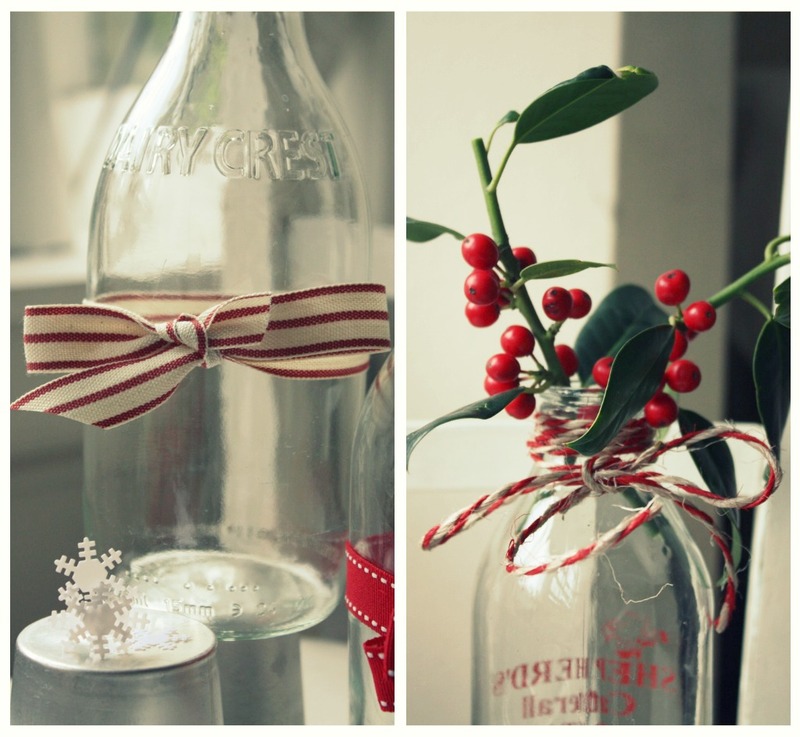 its such a lovely time of the year, bringing out all the old favourite decorations and adding a new twist to them all. Your photos are so creative! OMG Melissa! You are truly making your way back! I know this is crazy central for you right now, but you seem to be coping really well and getting your priorities in line ie. decorations, so lovely. Maybe your Miss and my Miss can get together and join up their metres of chains. We have just put up the tree this morning, after a drive to Penrith yesterday to pick and cut. I love English milk bottles and percured one of my sister's the last time I was home. Hoping you enjoy your leaving England party, it'll be bitter sweet for sure. Wishing you well with the relocation. Simple for us this year too Melissa - just a few favourites gracing my mantel piece, but I'm sure we'll add to it with some new home made treasures as the month draws on. 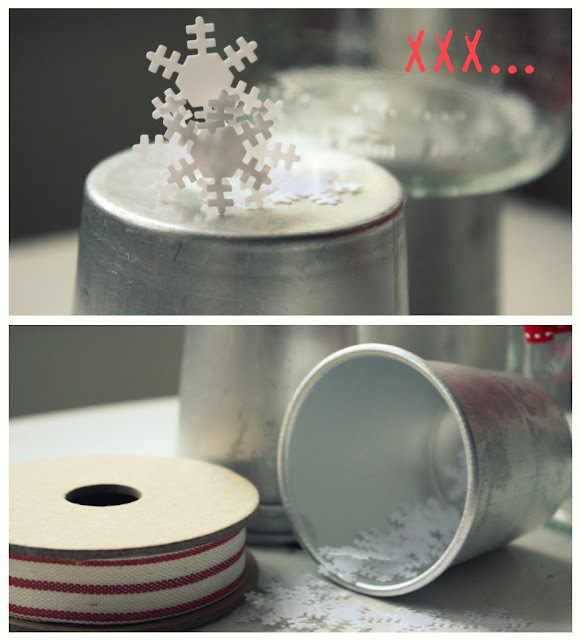 Your simplicity is perfect - love those little paper snowflakes - gorgeous.